The following article appears in the April 8, 2016 issue of the Atlanta Business Chronicle (link to article). Ellie Hensley is an entertainment, health care and general assignment reporter for the Atlanta Business Chronicle. Photo of Dr. Curran by Joann Vitelli. Dr. Walter Curran Jr. started running races at age six, while his peers were playing cops and robbers. He didn’t realize then what an early commitment he was making to his health, and he certainly never imagined he'd become a nationally renowned radiation oncologist, the first ever to lead a National Cancer Institute-designated Cancer Center. Since 2009, Curran has served as executive director at Winship Cancer Institute of Emory University, Georgia’s only NCI-designated center. The center earns international accolades for its groundbreaking research, for which it received $82.8 million in grants in 2015. Curran’s hand in this clinical research is one reason he is co-chair of NCI-funded NRG Oncology Group, a national oncology research organization made up of the top research leaders in their field. "He's a big player on the national stage," said Dr. Ian Crocker, vice chair of the department of radiation oncology at Emory. "He's not just an asset to our department, but he's a big deal nationally, and you probably wouldn’t guess that." 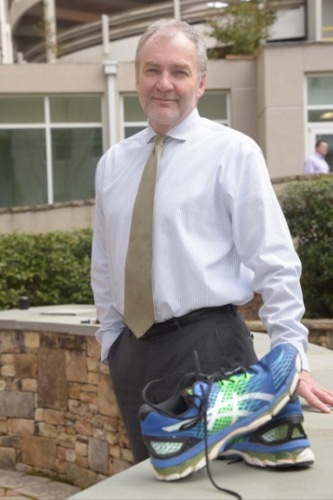 One of Curran's first moves when he was named the director of the cancer center was to found the Winship 5K. Although last year’s race, the event's fifth anniversary, was canceled due to bad weather, the previous year brought out over 3,000 participants. It is the second largest event held on Emory University's campus, behind spring graduation. "Some people thought it was a bad idea, because they thought there were enough 5Ks in Atlanta," Curran said. "But we've made it a great event. It's really become not just a healthy activity for people, but also very much a chance to just bring families of patients together." From an early age, Curran has lived an active lifestyle and preferred to stay on the go. He grew up two blocks from the beach in Massachusetts, and he and his sisters spent much of their time at the ocean and playing various sports. He continued running throughout his school years and loved running track in high school. "I found out I got shiny objects when I ran fast, so that was fun at a young age," Curran said. Growing up, Curran aspired to be an engineer because of his love for science. But by the time he arrived as a freshman at Dartmouth College, he shifted gears. "When I was assigned an adviser, I told them I wanted to go into medicine, but I wanted to teach and coach for a few years first," Curran said. "And that's what I ended up doing." Curran was the first member of his family to graduate college. After graduation, he taught at multiple locations, but he spent the most time teaching middle school and junior high science at LaGrange High School, where he also coached track. "I assume if he applied the same vigor coaching as he did to our department, they were probably the state champions," Crocker said. After five years, he enrolled in Augusta-based Medical College of Georgia and got his medical degree, after which he accepted a medical oncology residency at the University of Pennsylvania in Philadelphia. "I was pretty clear that I wanted to go into some oncology-related field, so it was really a matter of figuring out where the best opportunity and best fit was," he said. "I had a good experience rotating through Harvard's radiation oncology program the summer before senior year, and after that I was pretty clear what I wanted to do." Radiation oncology also afforded Curran the ability to kick off a career in medical research, and it also allowed him to tap into his previous interests in science and technology. After his internship and residency at the University of Pennsylvania, Curran accepted a position that included both seeing patients and conducting research. He was connected with the university for about 10 years before accepting a position at Thomas Jefferson University as chairman of radiation oncology and clinical director of its Kimmel Cancer Center. About 12 years later, Curran felt it was time to move on. "I really felt like we had accomplished a lot there, but perhaps I was at a plateau," he said. "I saw all the amazing things going on at Emory and also saw great growth opportunities for research and further development of clinical programs." Although NCI-designated cancer centers are typically led by health system executive types, Emory offered Curran position as its director, and he accepted. Curran is also the Lawrence W. Davis Chair of Radiation Oncology at Emory’s School of Medicine and a practicing radiation oncologist. He was offered the executive director at Winship a year after he came to Emory, but he was so passionate about chairing the radiation oncology department he convinced Emory's dean to let him do both, Crocker said. He has three full-time jobs, but he finds a way to make it work. "I asked him one day if he ever sleeps," said Diane Cassels, executive administrator of Winship. "And somehow every morning he knows every basketball, baseball, football score from the night before." Curran may be well-renowned in the scientific community, but he has never let it go to his head or affect the way he lives. He drove an old Subaru Forester until it absolutely fell apart, which Crocker teases him about. "I'm pretty sure the residents and interns in our department have nicer cars than he does," Crocker said. "I don’t think he knows what a new car is. For someone that's as important as he is, his personal needs seem pretty modest. The trappings of success aren't so important to him." Despite his many work responsibilities, Curran always finds time to spend with wife and four children, who are also quite active. Their family outings include lots of traveling, kayaking and spending time at the ocean. He also coaches his son's church league basketball teams. And throughout his life, he has remained dedicated to running, which helps him find balance in his hectic life. "Everyone realizes exercise is important, I think the challenge is finding time to do it," Curran said. "Even if you're too busy, a 10-minute walk is better than no walk. Five minutes of getting out of your chair or one minute an hour is better than no minutes. Whatever your lifestyle allows is better than nothing at all."